Monica Tanzey is an associate attorney who joined Schmitt Mulhern in October 2016. She is a member of the Missouri bar (2011). Prior to working at Schmitt Mulhern, Ms. Tanzey spent five years working as a general practice attorney with the Law Office of John Ryan in Grandview, MO. Ms. Tanzey is a 2004 graduate of West Virginia University where she received a Bachelor of Science degree in Journalism and Public Relations. While attending West Virginia University, Ms. Tanzey excelled as a member of the WVU Rowing Team, was of a member of the WVU Student Government Association, and a volunteer for CASA for Kids. Ms. Tanzey received her law degree in 2010 from Oklahoma City University School of Law where she graduated in the top 1/3 of her class. During law school she received several awards, including Dean's Honor Roll, Dean's Pro-Bono and Public Service Award, and top honors in her trial advocacy class. She also completed specialized coursework and received certificates in Health Law and ADR. Ms. Tanzey also received an MBA in Healthcare Management in 2013. Her master's thesis/capstone focused on nursing home compliance and best practices. Ms. Tanzey has a special interest in nursing home negligence and wrongful death matters. 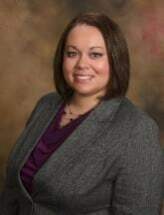 Ms. Tanzey is a graduate of the 2013-2014 Ross T. Roberts Trial Academy, she currently serves as Vice President of the Cass County Bar Association, and she is Secretary of the Cass County Youth Court Board of Directors. In her free time, Ms. Tanzey enjoys spending time with her husband and son, and raising and training Goldendoodles. She is an avid West Virginia Mountaineer fan, loves camping, trout fishing, and volunteering in her community. Ms. Tanzey focuses her practice on plaintiff's personal injury, including traffic accidents, nursing home negligence, wrongful death, and Missouri worker's compensation claims.